Medium to full bodied, this blend of rare aged tobacco has a perfect balance of flavor, complexity, and richness. A very enticing smoke with bold flavors that consist of strong notes of coffee and cedar with a long earthy finish. The 10 year old Ecuadorian Sun Grown wrapper and the 5 year old filler and binder are a perfect compliment of strength and complexity. 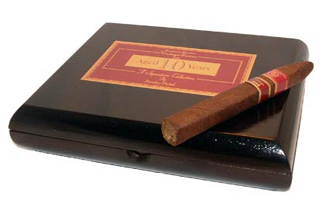 This cigar is recommended for the seasoned smoker that is in pursuit of a rare vintage smoke.